A five-run fourth inning by the Cincinnati Reds did in the Pittsburgh Pirates last night at The Great American Ball Park, culminating in a 7-5 Reds win that was their fourth straight against the Pirates. Plus-sized Reds pitcher Aaron Harang yielded five runs as he worked into the seventh, but he was matched run-for-run by the Bucs' Brian Burres, who allowed five runs, five hits, and four walks over 3 2/3 innings. The aforementioned fourth inning broke things open for the Reds, and was highlighted by the 6'7" Harang chugging all the way from first to score on an Orlando Cabrera double. Cabrera and teammate Drew Stubbs each had three hits on the night, with Stubbs hitting an insurance home run in the fifth against Jeff Karstens. The Bucco bats actually managed double-digit hits, with Delwyn Young's three double and Ronny Cedeno's home run leading the way. Ryan Doumit also had two hits for Pittsburgh after his big game on Sunday, giving the catcher five hits in his last nine ABs. 1B Steve Pearce left the game after spraining his ankle chasing down an errant throw from Young, and his status should be known today. 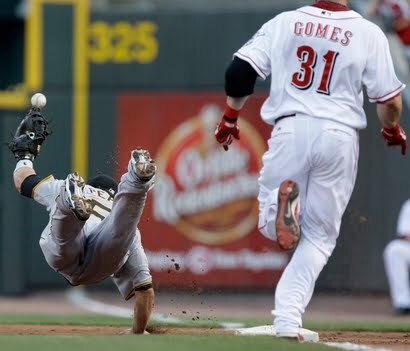 The two teams with reverse records (Pirates 19-26, Reds 26-19) meet up tonight for the second in their four-game set. Paul Maholm (4.50, 3-4) does battle with the impressive young Mike Leake (2.91, 4-0), with the first pitch slated for 7:10. I love the Buccos, but I wanna keep Flyer bashing. I live in Philly and drove over to the Post Office during lunch. I turned on the sports talk station, and the host was ripping Chicago for “never having won anything.” I’m sorry? Granted the Cubs and Blackhawks are in pretty serious championship droughts, but seriously? Michael Jordan and the Bulls? They won more championships in 8 years than all four pro sports teams in Philly have won in 35 years. Throw in the ’85 Bears and the White Sox whatever year that was, and I almost choked on my gum. A Phillies World Series in ’08 makes these people think they are the city of champions all of a sudden. Of course, they also like to mention the title that the Philadelphia Soul won in the Arena League (! ), and they took credit for the Lakers’ championship last year by saying Kobe is from Philly. I’m sorry, I just needed to vent. And my Flyers fan buddy sent me this today: http://www.flyersgoalscoredby.com/2010-archives/february/id-like-a-richards-with-a-side-of-richards-and-a-richards.html Please hide all sharp objects if you plan on reading it, and I can’t wait to see Toews out-leadership Richards for four games. Philly fans are delusional. I know who wrote last year after we lost game 5 to the Flyers "this game just proves why Philly sports is so much better than Pittsburgh". He also wrote this year that he wouldn't take Big Ben on the Ealges because he doesn't care about Super Bowls, just how the players act. I guess I wouldnt care about winning Super Bowls if my team couldnt win one, either! The Cryers haven't won a cup in 35 years. Hopefully, we'll be able to add another year or 10 to that. Oh, and if they can count the Soul's titles, we are counting the Passion!